Blake Lively was spotted filming more scenes with Barry Watson for ‘Gossip Girl’ in New York City, this time sporting a different outfit. Her vibrant citrus look featured an orange Alice + Olivia ‘Mandy’ sleeveless top with resin chain stripes, which she styled with a very pretty floaty floral-print mid-length Haute Hippie skirt. This easy, breezy look was styled with an exotic snakeskin Angel Jackson shoulder bag and a pair of aqua Christian Louboutin ‘Bollywoody’ embellished peep-toe platform pumps. A simple bun completed the second look of the day. I liked this look until I got to the shoes. I much prefer the first look. 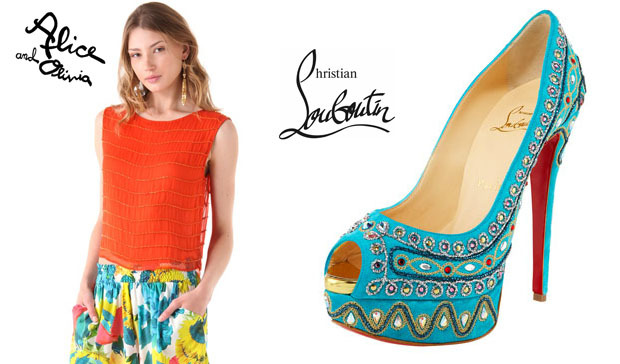 and her Christian Louboutin peep-toes fromNeiman Marcus and Bergdorf Goodman.